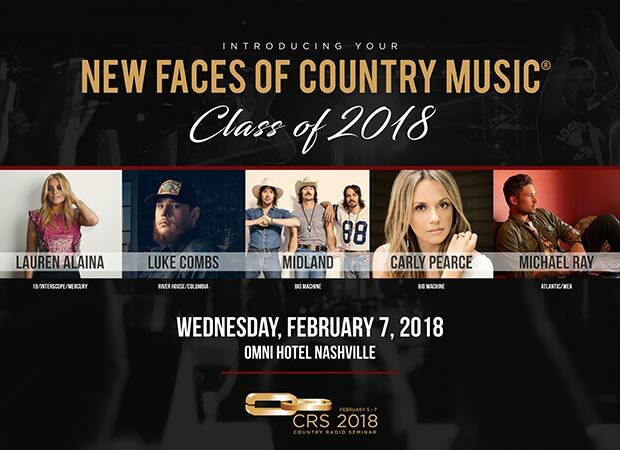 (Nashville, Tenn. – December 4, 2017) – Country Radio Seminar officials have announced the CRS 2018 New Faces of Country Music ® Show performers. The five acts to appear are Lauren Alaina, Luke Combs, Midland, Carly Pearce, and Michael Ray. About Country Radio Seminar: Country Radio Seminar is an annual convention designed to educate and promote the exchange of ideas and business practices in the Country music industry, with specific emphasis on issues relevant to Country radio. Country Radio Seminar 2018 is set for Feb. 5-7, 2018 at the Omni Hotel. Visit www.CountryRadioSeminar.com for more information. Like CRS on Facebook and follow CRS on Twitter (Hashtag #CRS2018).